The Hungarian Fitness Association (Magyar Fitness Szövetség) had the idea first in the world to organise fitness championships for kids called FitKid. The initiative had two purposes. On the one hand, it aims to educate youth about a healthy way of life and eating as well as regular sporting activity, on the other hand, its goal is to secure the upcoming generation for the adult Fitness Woman competitions. The first rule book was written by Katalin Gölt and Ildikó Csábi, and it gave the image of FitKid. The sport’s movement material is based on the movement material of field gymnastics (acrobatics), aerobics (aerobic jumps and power elements), rhythmic gymnastics (gymnastic jumps and flexibility elements) and dancing, but it differs from all of them. This gives its unique character and representational form. FitKid has had a detailed rule book, an evolved competition system and movement material since 1998, and it reached its extended, streamlined from as a result of continuous professional consultations based on experiences. In the 2005 competition year, the Hungarian Fitness Association expanded the possibilities of FitKid competitions with a new line, and it announced the FitKid Dance competition series. The purpose of the new competition form is to give a chance also to beginners for challenging themselves and for experiencing the mood of the competitions with the help of a lighter rule book. 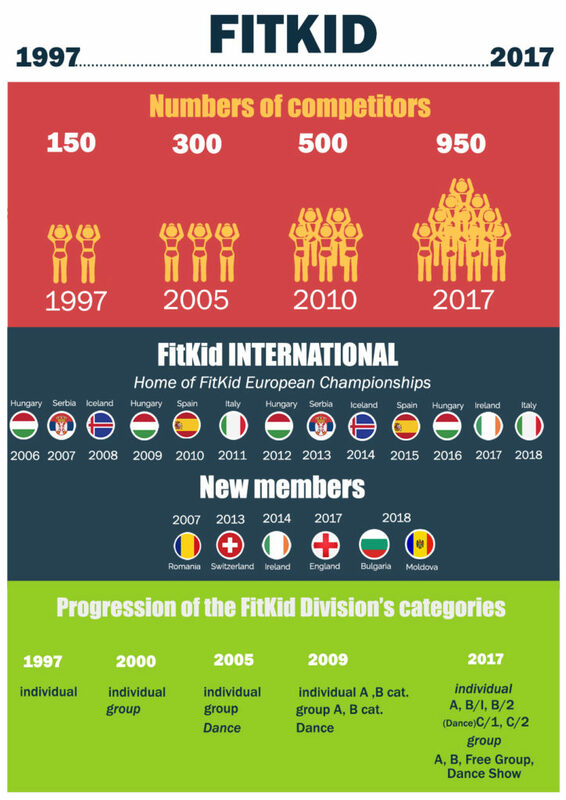 FitKid competitions turned out to be real sports competitions over time mirroring plenty of professional and training work. The number of participants and spectators increasing year to year and the enhanced interest from abroad proves its ever-growing popularity. As a result, the first international FitKid competition was organised in Barcelona in November 1999. Moreover, the International Fit Kid Summer Camp has been organised since 2007, while the first workshops were held in 2011 (Reyjkjavík, Nagyvárad). The FIT-KID programs are organised from January until December, and they encompass professional days, judge trainings, summer camps as well as the competition system, which means 9-11 events in every country.